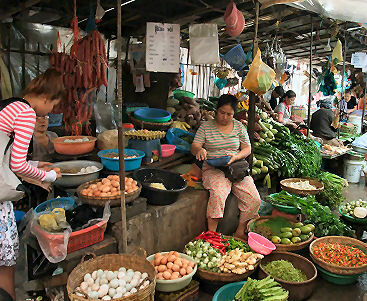 "After all that touring, you�re probably starved, so stop for a late breakfast at the Phsar Thmei or Central Market. A good Cambodian breakfast to buy here is noodle soup (kyteow) � thin, white rice noodles cooked in a soup with meat or seafood, bean sprouts, and lime. Bobor (rice porridge) is another favourite, served with either fish, chicken, or perhaps some salted egg as well as thinly sliced ginger, bean sprouts, and lime. 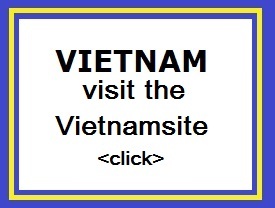 Or perhaps you prefer fried chicken or pork on rice, both regular Cambodian staples." Shopping in Phnom Penh is a unique attraction for tourists who love to buy back some souvenirs from exotic Cambodia. The Central Market (Phsar Thmei) in Phnom Penh is one of those busy bazaars that are always filled with crowd from one end to the other. 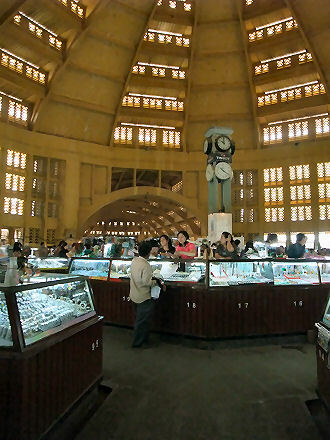 The unique, stunning ochre-coloured, art-deco Central Market is definitely a Phnom Penh landmark. The structure was built in 1937 in Art Deco style on an area that was until 1935 a lake collecting the runoff during the rainy season. Prior to the construction, Phnom Penh was limited to the area between the Riverside and Norodom Boulevard. At the western side of Norodom were some wooden farmer houses belonging to Khmer who lived from rice cultivation in the lakes. Dredging started in 1935 and opened the area up for expansion. When it first opened, it was said to be the biggest market in Asia; today it still operates as a market. The market is known as �Phsar Thmei� in Khmer which actually means �New Market�, however due to its location the English �Central Market� has caught on. Whoever loves to browse endlessly through small yet enticing shops, will find the Central Market (Phsar Thmei) in Phnom Penh an enchanting place. The market opens from 7:00 AM till 5:00 PM. The market is a 'must see' for tourists. Most tourists visit this market because they want to see the extensive amount of products that are offered for bargain. 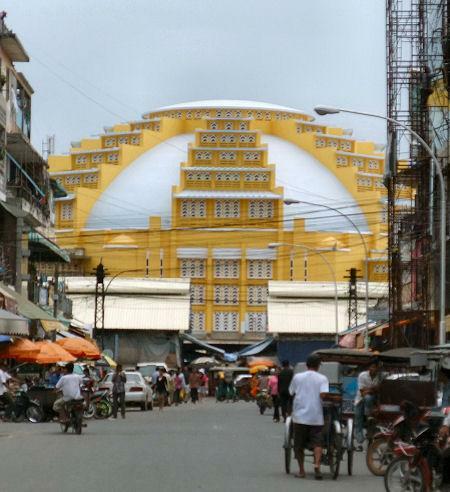 The four wings of this gigantic yellow dome are teeming with stalls that sell goods ranging from gold and silver, antique coins, money exchange, men's and women's apparel, clocks, books, flowers, food, fabrics, shoes, souvenirs, fish, seafood, dessert, luggage, and countless other products. The large domed building with its four wings is an amazingly cool place to seek refuge in the middle of the day, and is also a fascinating market to wander through. The area directly under the huge dome is given over to gold and watch merchants, while the wings are dedicated to electrical goods, household appliances, women�s clothing, and men�s clothing. Surrounding the market walls is a ramshackle, sprawling market area with tarpaulin sheets making a low roof. There is also plenty of second-hand stuff that you can buy here at an affordable rate. The gateway to the market is lined with hawkers who sell different kinds of delicacies. This area is also well worth exploring, however it is not as cool. Here you will find shoe stalls, a meat and fish market, various insect type snacks, an ample supply of flowers, as well as souvenir merchants hawking everything from t-shirts and postcards to silver curios and karmas. The area around Phsar Thmey is now the commercial centre of Phnom Penh. One block west of the market is Monivong boulevard, Phnom Penh's very busy main shopping street. In the northwest corner of the market is a taxi station for cars direction Battambang, Siem Reap, Kampong Cham, Kratie etc. The bus station is in the southwest corner.